Are all RTL2832U / E4000 DVB-T dongles sensitivity about the same when being used for SDR radio use? If you read the previous post on this site about using the RTL2832U / E4000 as a SDR receiver, I was less than thrilled about the sensitivity of the generic white DVB-T stick I purchased. After reading some glowing comments on how well some of the dongles worked, I started to wonder if some DVB-T sticks performed better than others. Unfortunately, this area is so new, there is not a lot of info out there about performance differences between the various RTL2832u / E4000 sticks. Maybe eventually some of this information will gradually become available as more people experiment with this device. What info I could find based on user comments made me think that the answer to the above question was basically yes. My guess is that most fo these dongles are based on a reference design which should mean that they all perform the same way. However, that is not always the case. Some manufacturers will often change the design to make it cheaper, change the form factor, enhance performance, or add features. For example, one user claimed that they had bought one of the tinier sticks and as it would heat up, the sensitivity would go down. Cooling it off brought the sensitivity back up. Some RTL2832U / E4000 dongles may have dead spots in certain frequency ranges where others may not. Also, these devices are mass produced in large quantities and quality control may not always be the best which can introduce more variables. Some users received non working sticks. Combine all of this with the fact you are asking the device to do something it was not designed to do. The white generic unit I received worked reasonably well below 200MHz, but anything above that it was pretty much deaf. I even popped open the case and checked if the right chip set was in there, and it was. So, I figured it might be worth risking a few more bucks to see if another dongle. Again, there isn’t much info as to which dongles perform better than others, but I did see a few good comments about the EzCAP EzTV668 dongles, I thought it would be worth another try. I ordered a EzTV668 from NooElec a USA vendor and got it in a few days instead of a couple of weeks. This particular DVB-T dongle was slightly more expensive than the generic white one, but does include a remote (pretty much useless at this time, but who knows) which probably adds to the cost. You pretty much just get everything in a plastic bag, but thats okay. The first thing I noticed was that the EzCAP is about twice the size of the generic white dongle. Not sure why, but it could be due to a slightly different circuit board design or due to the additional circuitry for the remote and power led. The build quality is much better also. 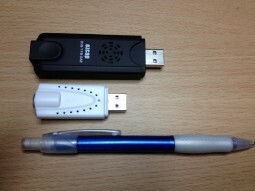 The EzCAP stick feels a bit more durable than the white dongle. The PAL antenna connector is much better also. The included whip and my PAL adapter fit more securely in the antenna connector. Thats all well and good, but was it better than my original GWS (generic white stick)? For some reason I could not get the EzCAP to work with HDSDR following the steps in the Setting Up Your RTL2832U / E4000 for SDR Use article on this sight. However, after installing the ExtIO driver mentioned in the article, SDR# worked fine with it. I then compared the two dongles using SDR#, the included whip, and an attic mounted discone antenna. GWD Dongle – Picked up strong local signals easily. EzCap – Better reception (as good as my handheld scanner with a whip) and many aircraft coms showing up in the passband. 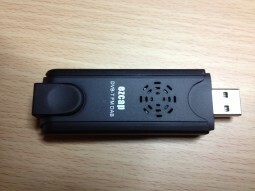 GWD Dongle – Just over the noise level but intelligible. EzCAP – Slightly worse than the whip, but this normal for the discone at 800MHz due to lack of gain and some cable loss. So you can see that the EzCAP performed dramatically better than the GWD dongle. Actually I would say that it performed on par with the Funcube dongle if not even a bit better. In the 800MHz band the EzCAP performed as well as my other 800MHz capable radio. So, needless to say I am much more impressed with the RT2832U / E4000 radio dongle SDR radio. This is a heck of an SDR deal for under $35 dollars. I would highly recommend if you get a RTL2832U / E4000 dongle for SDR use. Set it up and try to pick some known strong frequencies that in the 70MHz – 1000MHz range. If you are getting weak or no signals in this range, you may have a not so good or defective dongle. 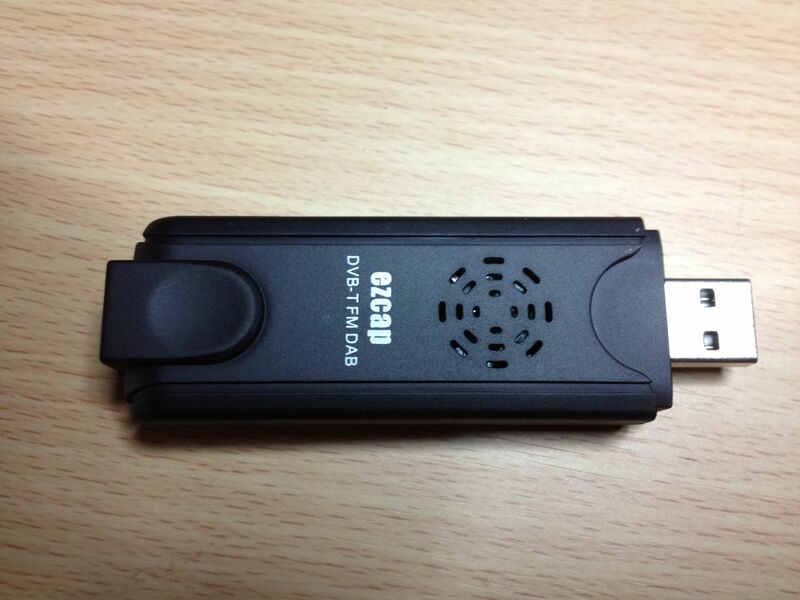 I have been experimenting with the DVB-T dongles for a while too now. I have the Newsky TV28T from Aliexpress.com and it works great. I was surprised how well the little antenna that comes with it works. I am able to receive NOAA broadcasts as well as the 800 Mhz public safety nets with no problem. I did place a snap style ferrite core around the end of the antenna wire near the dongle and that seemed to remove a lot of extra noise, especially in the lower Mhz range. I am sure the quality of the dongles will differ greatly. I bought a EzCap (non RTL) and thought the build quality and plastics were of much better quality. Please correct the website link in the original comment, it was supposed to be: http://www.n4jtc.com. Thx and 73! Thanks a lot for the test. Just two days ago I started playing with SDR# and a Terratec Noxon DAB stick. First impression, I was totally blown away by the sensitivity and possibilities with this unit. Even receiving with the tiny mag mount whip, which is designed to receive around 200 MHz (Digitab Audio Broadcast in Europe), I heard plenty of stations in the 4m band, which shows its enormous sensitivity, because the antenna is a total mismatch there. Plugging it into my discone I could not believe my ears. It excelled all my scanner receivers and FunCubeDongle by signal to noise with one significant drawback – as soon as there was a “strong” signal within the next 20 MHz +-, it saturated the front end. You could tell that by looking at rapid movement of the noise floor and logically this would be lethal on the AIR band, since almost every stronger station would modulate any other carrier or modulated station, ending up hearing volmet on other signals as well as every single aircraft within 20 miles would push the noise level around and interfere with other signals. The really strong AM signals would sound very low on volume and distorted, sinve the 8-Bit A/D converter is already on the limit. If I listen to the Brazillian pirates on the US military SATCOM network on 255.550 MHz +- and all the other pirates up there, the receiver is absolutely stable because the is no strong signal within the wide open front end – quite impressive how well it exceeds my BC-9000XLT in signal to noise. On 70cm Ham band it also worked very nicely with the described front-end overload issue again. Trying to use it as an aircraft transponder receiver on 1090MHz, it failed, because it locks out around 950 MHz, no wonder being originally designed to work between 60 and 250 MHz. Now I am curious to try a different dongle to see if it really goes all the way up to 1.7GHz as some say. I am considering buying the EZCAP or if I find someone telling me another is better, anything else. Owning a FunCubeDongle now makes me wonder if there is something wrong with it, because the FCD does not even get near the results of my Bearcat scanners, though I must say, I have never ever seen any of the front end saturation issues my Noxon produces – on the other hand I have never seen ANY receiver being so sensitive, producing so many far away signals with such a brilliant signal to noise than anything else (as long as the nearby frequencies are quiet!). With a portable whip antenna the Noxon to me is the perfect dongle for on the go, since its issues are not as visible as they are usding a discone on the roof. I hope that gave you and idea about my experience. Now I am curious what kind of software will be developed opening interesting views to digital modulations for essentially no or very little money. At this point a very big thank you to all SDR-SW developers – guys you really bring a fresh wind into our old-time hobby! One out of four of my DVB-T dongles was deaf. Inspection of the PCB, and I found two shorted pins on the RT chip. All better now (lucky). Try inspecting with a good eye loupe. Eventually we will see every manufacturing defect imaginable get into the wild. If there is somewhere to upload pictures, known quality defects, troubleshooting procedures and typical performance data, I’d be willing to document my dongles.